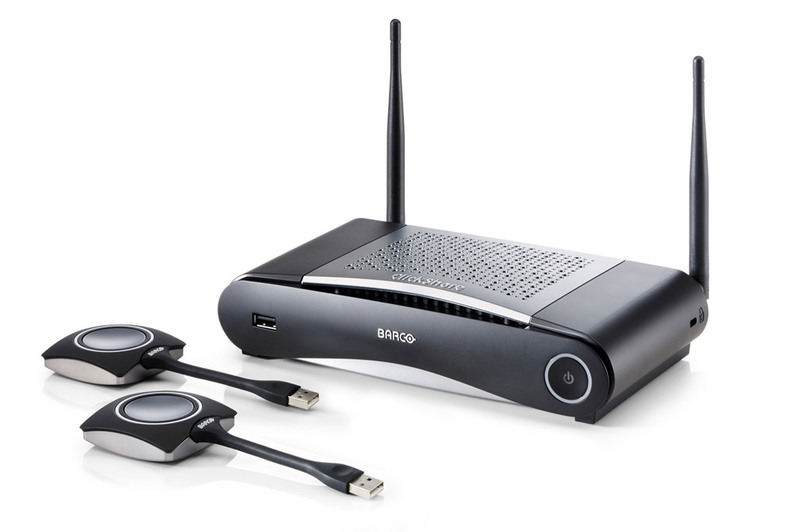 Barco ClickShare CSE-200 with 2 x USB Buttons Standalone or network integration operation 2 x Buttons included 2 x users on screen HDMI out (Full HD) output AirPlay, MirrorOp, iOS app, Android app ClickShare is Barco’s wireless presentation system which has revolutionised the meeting room experience and made connecting cables a thing of the past. Participants can simultaneously share content on the meeting room screen with the click of a button; no software installation is required – just connect and go. Once connected ClickShare will always display the most optimal resolution, without messing up the layout on your laptop. ClickShare gets all meeting participants actively engaged by giving everyone the opportunity to be on screen. This enhances collaboration, and leads to better and faster decision-making. With ClickShare your meetings will never be the same again! Creativity is one of the core assets of your organization. With ClickShare, you can make sure ideas receive the attention they deserve. This wireless presentation system allows users to simply share what’s on their laptop or mobile device, on the presentation screen. No cables, no set-up, no waiting to join in. Plug in to stand out The CSE-200 offers the ClickShare experience for small and medium-sized meeting rooms. Anyone – including guests – can connect with one click and share right away, without the need for any training. Users simply plug a USB-powered device – the ClickShare Button – into their PC or Mac and click the button to get the content from their laptop on the large meeting room screen. With the ClickShare App, users can also share content from their mobile phones or tablets. Encouraging collaboration The CSE-200 was designed for enterprise rollouts and offers enhanced security features, a wider range of connectivity options – including AirPlay support – and central management. Allowing up to 2 persons to share content simultaneously, the CSE-200 ensures direct connectivity to the central screen and encourages collaboration. For user convenience, security features of the CSE-200 can be set to one of three predefined levels, depending on the company’s policies and needs. Last but not least, the device’s API also makes integration into the company network a lot easier.